As image and other data needs become more complex, virtualized solutions increasingly protect against real disasters, but many facilities and vendors are not there yet. Traditionally, data backup and disaster recovery were part of an imaging department's PACS. As a result, business continuity and disaster recovery tended to be compatible exclusively with that PACS. Fast-forward to 2015 and the need to share and access data across departments has grown exponentially. "When thinking about health care information access needs, there are no 'four walls' anymore,'' says Tomer Levy, general manager of the workflow and infrastructure business unit at McKesson in Atlanta. In 2015, many imaging departments, especially larger ones, are finding that their PACS-based disaster recovery solutions are no longer sufficient. 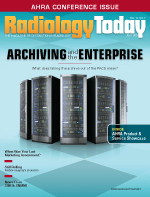 "The newer way," says Charlie Lamb, president of LAMB Technologies in Irving, Texas, "is vendor neutral archiving, where storage of the images and other clinical data is independent from the PACS." Also making headway is cloud-based backup and disaster recovery, where information is stored virtually for eternity if necessary. There are several good reasons why more health care organizations are moving from PACS to vendor neutral architecture and virtual backup to boost their ability to continue to operate smoothly in the event of a disaster or to recover data should they experience technical failure—either minor or major. One is cost. Costs for backup and disaster recovery can soar when organizations have more than one PACS, Levy says. The cost of maintaining servers and replacing existing equipment, not to mention maintenance and power costs, can be considerable. "Consolidating to a VNA [vendor neutral archive] architecture is often the most cost- and workflow-effective solution," Levy says. Also, he says, it allows physicians to have instant access to entire records regardless of where the images were taken. "Through VNA, sites are able to meet the needs of their growing health system by enabling image archiving, management, and delivery with minimal resources and with little to no disruption," Levy says. Instead of continuing to purchase more servers and manage a data center, many organizations are finding it may be time for a completely virtual server environment as well, Levy says. A virtual server environment includes the main center and a mirrored system in a disaster recovery location. The rapid adoption of EMRs is another reason more are migrating to VNA. "EMR systems are changing the landscape," Levy says. They are making the need to incorporate images into medical records even more of a priority. "The growing use of EMRs also means integrating more EMR data—multiple patient identities or encounter information, for example—into the imaging record." A VNA and a viewer shared enterprisewide are often more effective than integrating each PACS on the enterprise, Levy says. "EMR users want a single, easy-to-use viewer that is able to present the complete patient imaging record, from radiology, cardiology, nuclear medicine, and other exams, from all sites across the health system." Recent federal rules and regulations are yet another impetus for the move to VNA and virtual backup. The regulations make it more important than ever that health care organizations, including their imaging departments, have ways of securing their data from "reasonably anticipated threats." The HIPAA security rule requires that health care organizations have both physical and technical safeguards in place that ensure the integrity and availability of electronic health information. The rule also requires that the organizations have contingency plans in place for disaster recovery and test them regularly. In addition, new HIPAA privacy and security rules that are part of the ARRA require health care organizations to be able to access data in a timely manner. Few PACS and their disaster recovery solutions are able to meet all these requirements, imaging technology experts agree. Government regulation determines how long facilities need to retain imaging studies and related records, notes Lamb. Data retention regulations can vary from state to state, "which are other factors in the equation for how much data you have to back up and need to restore in the event of a disaster," he says. Consolidation in the health care industry is still another impetus for cloud-based vendor neutral backup and disaster recovery systems. "Consolidation of organizations—hospitals, clinics, and even medical practices—has also spurred the need for interoperability," Levy says. When each facility has its own PACS and configuration, it can make it difficult to share clinical data, workload, and archiving solutions. Finally, says Jay Savaiano, a worldwide business development/technical sales executive at CommVault in Tinton Falls, New Jersey, a virtual backup site protects against a hurricane or flood or other disaster taking out an entire location. "Hurricanes happen," he says, "and they can take out an entire location if you have all that data sitting in one room." While many agree that VNA architecture makes business continuation and disaster recovery solutions easier to implement, not everyone is ready or able to move in that direction just yet. "A lot of VNA vendors are just not coming forward with disaster recovery type of approaches," Savaiano says. Some health care providers are just beginning to take advantage of electronic and virtual technologies. "There still are hospitals that are implementing electronic health records for the first time," says Shannon Werb, CIO of Virtual Radiologic (vRad) of Minneapolis, a technology-enabled national radiology practice. vRad's more than 350 radiologists read imaging studies for and connect with more than 2,000 facilities worldwide. "We operate as a cloud service to our customers (facilities and radiologists), but we built out and maintain our own data centers such that we can control and touch the equipment and service it ourselves, delivering the SLA [service-level agreement] our business requires," Werb says. vRad believes cloud services are approaching the SLA requirements required by most health care organizations and as such has a plan to move its backup data center entirely to the cloud by the end of 2017. Werb looks forward health care grade cloud services because it means lower cost and greater efficiencies. "When it's up and running, it will mean I'm no longer buying millions of dollars of hardware every couple of years and keeping it cool and maintaining it when I don't ever use it in a backup data center environment," he says. Lamb agrees no one solution fits all. "The moral of the story is everybody's situation is a little bit different. The level of service desired and the study volume will determine how sophisticated of an approach to business continuation and disaster recovery you need," he says. Vendor neutral architecture makes it easier to store and back up data, but smaller facilities may be able to keep their primary data storage under one roof using their PACS and easily back it up using any number of traditional backup systems and services. "It could make things a lot simpler for them," he says. The larger and more sophisticated the enterprise imaging system is, the harder it is to back everything up and assure that it's reliable," he adds. The best disaster recovery solutions, whether cloud-based or not, need to be flexible and able to expand. They need to be able to carry the enterprise well into the future, the experts agree. The University Hospitals (UH) Health System in Cleveland consists of four hospitals and 12 satellite outpatient centers as well as six community hospitals in the surrounding area. UH processes around 800,000 image exams, averaging about 2,200 per day over 25 sites, and is growing. Another around-the-clock facility is scheduled to open next year. Initially, UH Health System had a PACS-disaster recovery system with two linked servers that were in one location. Should one server fail, the services and applications shifted to the other. Data were still accessible from short-term storage. However, the system did not protect against a physical disaster that could take out both servers in the same location. A team that included radiology PACS experts, IT networking experts, vendor representatives and hardware designers sought to find a solution that would provide reliable backup in the event of a disaster. It chose a solution that included migrating from physical servers to virtual Windows servers. At the end of January, UH upgraded its entire PACS, which had been started in 2003, and completed the migration. Despite the size of its operation, the transition was accomplished with less than 15 minutes of down time. The only noticeable difference to users was that a previously blue icon was green. Users might also notice that accessing images on the new system takes less time than before. The system continued to work as usual, which was the goal, says Beverly Rosipko, RT(R), CIIP, UH PACS manager. "It was a huge achievement," she says. "We're very proud of our system here and minimizing our downtime." (Industry-standard downtime for a migration as massive as this had been around 12 hours, according to Sectra, which executed the PACS migration.) The original system had 3.8 million studies that were performed between 2004 and 2011. The new disaster recovery system has expanded to 4.8 million studies. The new system makes it easy to assign more image storage when necessary and offers greater redundancy to ensure that it remains operable no matter what happens, Rosipko says. "We test it quarterly," Rosipko says. "We run on backup just to make sure it can handle the load and do everything it's supposed to." So far so good, she says. "We have a guaranteed uptime of 99.9%. It's highly reliable." — Beth W. Orenstein is a freelance medical writer based in Northampton, Pennsylvania. She is a frequent contributor to Radiology Today.